The Holder Mine Recreation Area is a part of the 50,000 acre Citrus Tract of the Withlacoochee State Forest. It is located southwest of Inverness with access via forest road Trail 10. 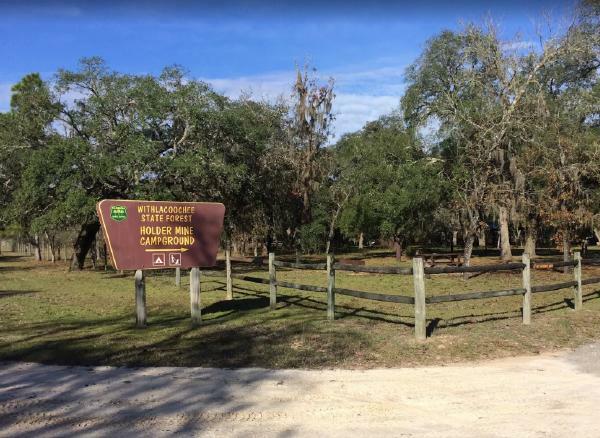 This area is also part of the Citrus Wildlife Management area where hunting is allowed, so be aware of hunting seasons when visiting or hiking in this area. The main feature of the Holder Mine Recreation Area is the Holder Mine campground - with 27 campsites. Each campsite has electric service, water, a picnic table and fire ring. Some have free-standing grills. There are two bathhouses at the campground, as well as a covered pavilion and RV dump station. The pavilion is for use by registered campers. Pets on a leash are allowed in the campground. Two loop trails have spurs to their trailheads at the Holder Mine Recreation Area. The Citrus "A" loop is 6.7 miles long, and begins about one mile from the campground. The Citrus "B" loop is 12.6 miles long, with about a two mile hike from the campground. There is a first-come, first-served primitive camping area along the western reaches of the Citrus "B" loop trail. Both trails wind through a variety of natural communities, including sandhill scrub, longleaf pine stands, and rocky hammocks. lowland portions may be wet during rainy season. The Florida National Scenic Trail also winds through this area from north to south. You can reach it by hiking west on the connector trail that joins the Citrus "A" and "B" loops.